Being a candid wedding photographer is what drives me to create better beautiful images. Indian weddings are colourful and filled with so many rituals. This event included haldi and sangeet. The bride and groom flew down all the way from Delhi and this image was taken during the haldi ceremony is an event during an Indian wedding in which Paste of Turmeric is applied on the bride and the groom's body before their wedding. 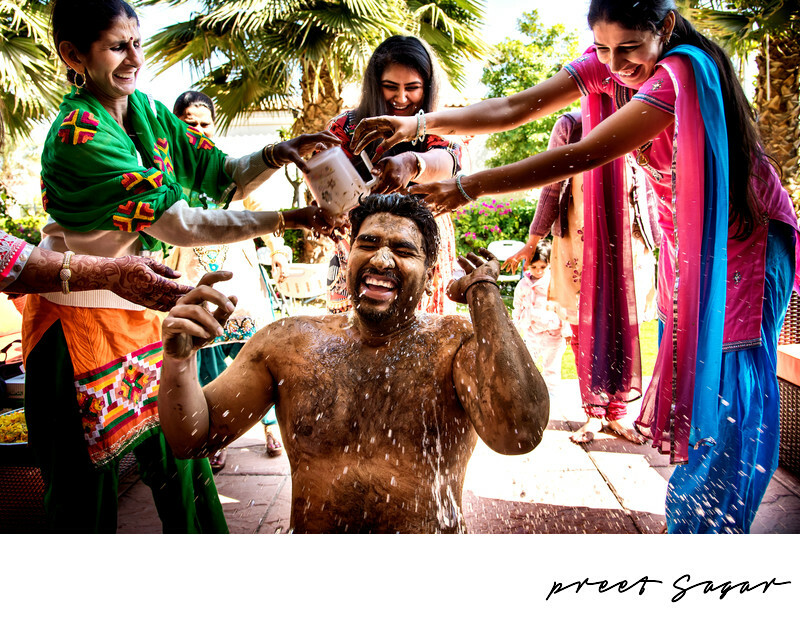 This ceremony was held at the groom's home, on the morning before the wedding day where his family apply the haldi paste on his body and then shower him with ice cold water as a mischief. The haldi wedding ceremony is a pre-wedding event where bride and groom's family applies paste of turmeric on the bride and the groom's body. The yellow colour of turmeric is considered very auspicious in the Indian traditions, turmeric is also known to contain antioxidants as well as antibacterial properties providing amazing benefits for skin, hair and health acting as a herbal wedding face mask leaving the skin fair and glowing. This ceremony is held at both the bride and the groom's place, on the morning of the wedding day or a day before the wedding followed by a small pooja ritual. In a few cultures, this ceremony is also held a day before the wedding, after the mehendi ritual. Location: Motor City - Dubai - United Arab Emirates.